In addition to the increased availability of fantastic drinks, another great perk of the modern cocktail renaissance is the emergence of better-quality bars. In addition to the usual iterations: hotel, dive, sports, gay, etc. (here's a cheeky post on 14 variations), we now have cocktail bars, places that serve custom-made, quality drinks with fresh, interesting ingredients. Some people like to call them "speakeasies," but that label is too pretentious to me (except, perhaps, among those cocktail that really do fancy themselves as "speakeasies," which I try to avoid). To me, they are cocktail bars. On the recommendation of the Washington Post restaurant critic, we made our way to 2 Birds 1 Stone after a recent dinner on 14th Street. Our first challenge: finding the place. I knew that 2 Birds, I Stone was underneath restaurant Doi Moi, but I didn't know how to get in. We walked back and forth near Doi Moi's 14th Street entrance a couple times before heading down side street S. Behind Doi Moi's outdoor seating area, is a brick staircase leading down to a below-ground entrance. Keep your eyes peeled and you'll see a sign (pictured above) pointing the way. Unlike the darkened interiors of similar bars I've been to (Pepe le Moko or Death & Co., for example), the interior of 2 Birds 1 Stone is bright and inviting: well-lit and predominantly white interior punctuated by exposed brick. The long centerpiece bar is surrounded by small seating nooks. Although it was busy when we arrived about 8 p.m., it wasn't crowded, and we were able to get two seats at the bar immediately. The bar, as well as the bars at restaurants Estadio and Proof are managed by Adam Bernbach, one of D.C.'s leading names in good cocktails. In 2 Birds I Stone, he's created the kind of cocktail bar I love to frequent: an inviting space with delicious, original drinks. The frequently changing menu is hand-drawn (a gallery of previous menus is available on the bar's website) and features a mix of classic and original drinks. 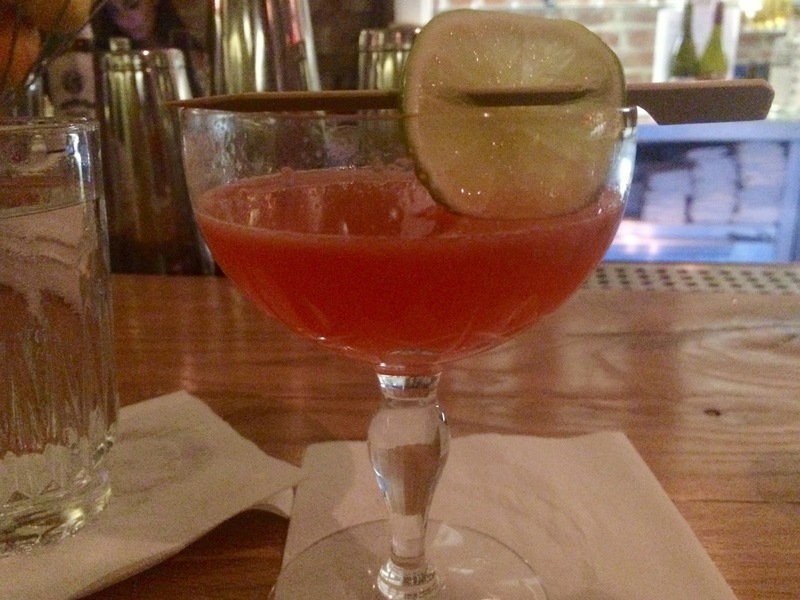 Chris ordered the Hideout, with with Za'atar-spiced bourbon, Aperol and dry vermouth. I love the idea of infusing spirits with Za'atar, a Middle Eastern spice blend that commonly includes sesame, thyme and sumac, and the Hideout is a delicious drink. I had the Devil's Grin, a tart and satisfying blend of High West Silver Oat Whiskey (a white, i.e. unaged, whiskey), Campari, amaretto and lime. The summery drink was featured on the Kojo Nnamdi Show in 2012, about a year before 2 Birds 1 Stone opened. If you want to try making it yourself, the recipe appears below. 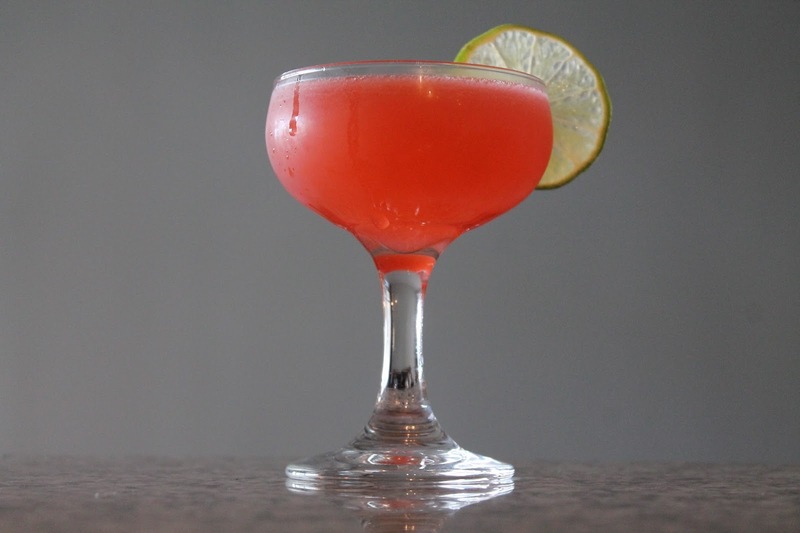 Combine the whiskey, lime juice, amaretto, Campari and simple syrup in a cocktail shaker. Add ice and shake until chilled. 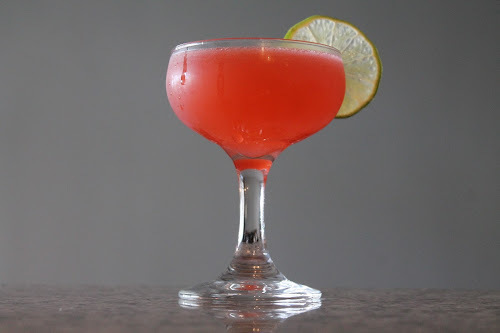 Strain into a chilled cocktail glass and garnish with a lime wheel. 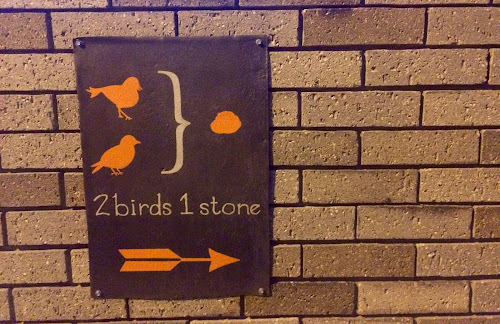 2 Birds 1 Stone, 1800 14th Street, NW (underground beneath Doi Moi, entrance on S Street), Washington, D.C. (Logan Circle/U Street).